Let’s face it, building or running a call centre is a simple task, you only need to get 4 things right, employ the right people following the right processes using the right technology and all installed in the right environment. No problem there then. So why is it that so many people struggle with the concept. How many times have I been told by senior board members that they have taken the decision to build a call centre based on the fact that other companies have one and not because of a need to deliver improved levels of sales or customer service. Many companies confuse the difference between customer service and customer care. One being a process-driven activity and the other requiring foresight and understanding to always stay one step ahead of a customer journey. 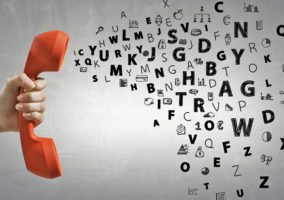 Without a clear definition of what the call centre is for and, even more importantly, how you will know when it is achieving its goals, it is very difficult for the call centre management to deliver a successful outcome. The call centre is only as good as its last call! And the person who handled it. People are your strongest and weakest link, so make certain you employ the very best. However, that is not enough unless you are able to manage and motivate them effectively. Selection, recruitment, induction and training are key to employing people who will feel and work as part of a team. This is also the time to identify future team leaders and managers who you can mentor to ensure they continue to grow within the organisation. Establish a communication system that ensures everyone knows what is expected individually and from the centre as a critical part of the business. Management by walking about (MBWA) should still be a very powerful exercise in all management tool bags. The one-minute manager by Kenneth Blanchard and Spencer Johnson is still one of the best management guides I have ever read. Business processes are in many ways the boring but essential part of the journey to developing a customer-led operation. Many of my new clients think they can simply transfer an existing operation into a new centre without first reviewing every process for suitability, currency and potential improvement. My reference over the years has been a book called Moments of Truth by Jan Carlzon, which graphically highlights how to establish a customer-driven organisation with processes owned and managed by empowered employees. My experience tells me that the frontline people know exactly what the customer needs and exactly what needs to be delivered. Just give them a chance to be involved, along with ownership of the relevant customer-facing processes. Never let the IT department drive the decisions over the technology platform. Technology should in all cases support the needs of the customer-driven processes. Technology solutions should be designed to support your business. They need to be flexible and responsive to any changes in customer behaviour or new product or service offerings. It may not be thought of as an IT subject, but the correct use of a headset is vitally important to the level of service delivered. How many times have you called a help desk only to listen to background noise and not the agent? While I am on my soapbox, how about agents using the NATO phonetic alphabet for clarity when reading back information? Many of the operations that I have been involved with have struggled with the effective use of IVR, music on hold, CTI and the announcement, or not, of queue times. All of these options require careful thought as to how they can enhance the customer experience as well as reduce agent involvement. Most businesses give limited thought to the environment or layout of a call centre. Their prime motivation is to fit as many people as possible into the available space. They fail to grasp the importance of providing sufficient space for individuals, teams and breakout areas. 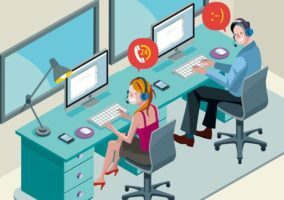 Most also miss the benefits of a particular layout to enhance, for example, a telemarketing operation, such as the use of plants to deaden noise and even the importance of not locating the call centre on the ground floor because of constant distractions outside the windows. Lighting and air-conditioning are also very important. One of the most effective centres I have seen looked very much like an air traffic control centre, with task lighting and overall low lighting levels. Beware of air-conditioning outlets that are directly above agents, as icy blasts of chilled air will very soon cause back and neck problems. And finally, many clients ask me to comment on the option to outsource their operation. So why continue running your own centre when there are outsourcing options available? In my experience, “control and quality” are the key words. Many companies just don’t have the capability or the space to develop their own centre. However, I have seen a number of outsource contracts get into difficulties because of a failure to plan ahead for the management time and involvement needed to monitor performance and maintain ongoing liaison with the outsource provider. There are, of course, multiple levels of outsourcing now available, including fully hosted and cloud solutions which enable you to develop the centre with a limited capital expense whilst maintaining control of your own agent workforce. So there you have it, a rundown of the key issues that most clients struggle with in one way or another. An imbalance in any of these areas can lead to performance levels below that which is expected. Unfortunately, it is not always so easy to identify the poor performing areas from inside an organisation.